5. Prepare the General Plan We are here! 1. Project Initiation: Let’s get organized! During this phase City staff and the General Plan Update Consultants will lay the groundwork for a successful process. The General Plan Advisory Committee, and the Planning Commission and City Council will receive an overview of the process and provide the planning consultants with information on key community issues and future opportunities. The General Plan Team of City planners and planning consultants will formulate a robust community engagement strategy that includes project branding, a website, and newsletters. 2. Prepare Background Data: Where are we and who have we become? During this phase the General Plan Team will review existing plans and collect new data needed to form the baseline existing conditions analysis for the General Plan. The General Plan Team will also engage the community to better understand what matters to residents. The goal is to get a good idea of where Union City is now and what kind of community Union City has become so we can have a clear starting point for envisioning Union City in the future. 3. Identify Issues and Opportunities and Confirm Vision: What kind of community do we want to be? The community visioning process will include several opportunities for the community to get involved by attending workshops and participating in online discussions. 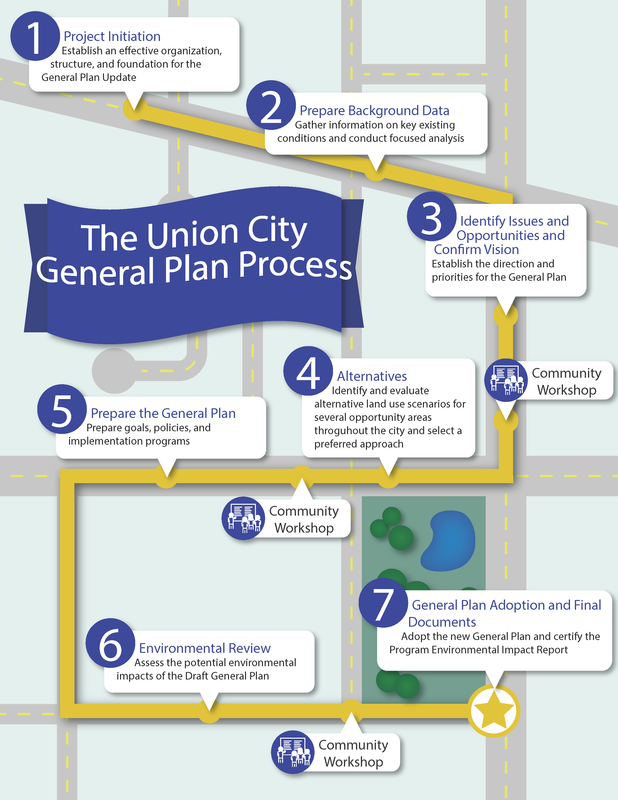 This input from the community is essential for the next phases of the project and will be used to develop a vision of what Union City should become in the future. The General Plan will be the City’s tool for reaching that vision of the future. 4. Alternatives: How should we grow and change in the future? An important aspect of the General Plan is the land use diagram, which sets the direction for land use in Union City. The land use diagram will identify areas where the community wants land uses to change or to stay the same, and it will determine the types of land uses that will be allowed or encouraged in the future. During this step in the process, the City will consider and analyze different land use scenarios, with several opportunities for input from the community. At the end of this phase, the City Council will choose a preferred alternative based on information gathered by the General Plan Team, growth forecasts to 2040, and input from the community, the Economic Development Advisory Team (EDAT), the General Plan Advisory Committee, and the Planning Commission. 5. Prepare the General Plan: How do we achieve our goals? The goals and policies make up the heart of the General Plan. They are the mechanisms for achieving the community’s vision of the future. The General Plan Advisory Committee will hold several meetings to discuss policy updates. Based on direction from the City Council, the General Plan Team will prepare a Public Review Draft of the General Plan. 6. Environmental Review: What are the potential impacts of our plan? A General Plan is considered a project under the California Environmental Quality Act (CEQA), so the City must analyze the potential environmental impacts of carrying out the General Plan. The General Plan Team will prepare a programmatic Environmental Impact Report (EIR) with opportunities for community review and comment. 7. General Plan Adoption and Final Documents: How do we turn our plan into action? The General Plan will go to the Planning Commission and the City Council for public hearings. The City Council has the ultimate authority to adopt the General Plan. The community will have opportunities to provide comments to the Planning Commission and City Council during the final public hearings.